Want to teach yourself how to code, but don’t have a lot of extra scratch laying around to learn how to do it? Nowadays, there are tons of resources available on the Internet that you can use to get yourself up to speed on all of the most advanced coding languages, often without having to drop a dime for the privilege. Though only one of the learning portals listed here will actually leave you with a degree to pin on your wall by the time all is said and done, having the skills these websites provide is still a great way to get started in the world of independent contracting, and being able to build your very own websites on the fly. That’s what admission administrators for programming classes everywhere were probably saying to themselves after they discovered Khan Academy. A completely free learning resource filled with hundreds of different subjects to learn, Khan Academy features not only the slickest UI of the bunch, but also one of the widest variety of classes that you can pick up anytime you’re ready to hit the books. What started out as a small project launched by a few friends has since blossomed into one of the premiere online learning destinations for anyone who needs in an education in a variety of subjects including (but not limited to): economics, mathematics, biology, art history, and yes, computer science. You can enjoy all the benefits of a real college class without entering into crippling student loan debt thanks to the Academy’s 100% free course load in computer programming, Java, CSS/SQL, and HTML. So head on over to the Khan Academy website and get studying soon! Did you know you can go to one of Boston’s finest institutions – the Massachusetts Institute of Technology (better known as MIT) – 100% free? You won’t walk away with an actual degree, but it’s hard to complain about having access to a constantly growing library of recorded lectures from one of the most prestigious universities in the entire world. Not only do you get videos of all the lectures, you’ll also be privy to the full set of course materials, as well as the associated assignments, lecture notes, and packs upon packs of related PowerPoint presentations depending on the subject you select. The classes available at MIT are both the most rigorous and rewarding curriculum you’ll find here, covering all aspects of nearly every programming language in use by major tech firms today. In this same vein, however, they are also the least forgiving, and not recommended for anyone who might benefit more from the more personalized approach such as what you’d find at Khan, or our next entry into the running; Udacity. 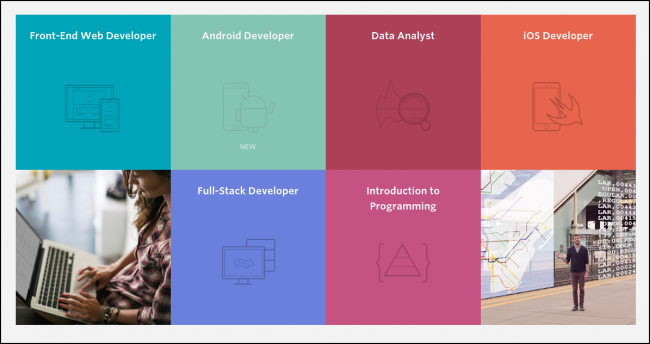 Udacity offers both a free set of courses that you can take without opening up your wallet, as well as personalized, custom services that cost anywhere from $40 to $200 per month. This runs well below what you’d expect to pay even at your local community college, so head on over to the Udacity programming portal to find out when the signup for their next semester begins. The website will help you graduate with what they call a “Nanodegree”, which is like the real thing, just a little bit… smaller. Udacity also benefits from its long held partnerships with big name tech giants like Google, Salesforce, Cloudera and AT&T, all of whom actively recognize degrees and certifications earned through the Udacity learning regimen. Some of the more popular Nanodegree programs include the option to become a Full-Stack developer, a front-end web developer, or learning how to create apps and games for both iOS and Android mobile devices. If you ask coders themselves what the best way to learn the craft on the cheap would be, 9 out of 10 will likely refer you to one place: Codecademy. Much like other options offered here, Codecademy has made their full library of materials and courses available to the open public for free, relying on venture capital and outside investors to keep its dream of changing the way we learn online alive and kicking. “We’re committed to building the best learning experience inside and out, making Codecademy the best place for our team to learn, teach, and create the online learning experience of the future,” reads the company’s website. ALISON is yet another portal that offers a collection of programming classes as just a fraction of the 600 other courses prepared on its site, ready to give out to anyone who’s willing to put in the time and energy to improve their skills for the job they have now, or a position they’re hoping to qualify for in the very near future. ALISON even lets you earn a “diploma” in its courses, though it’s hard to say just how valuable this is considering that it’s a free online course, rather than an established learning institution which employers might recognize right off the bat. Even so, with its extensive list of certification tests, there’s no shortage of benefits that you can enjoy once enrolled in the ALISON student registrar. 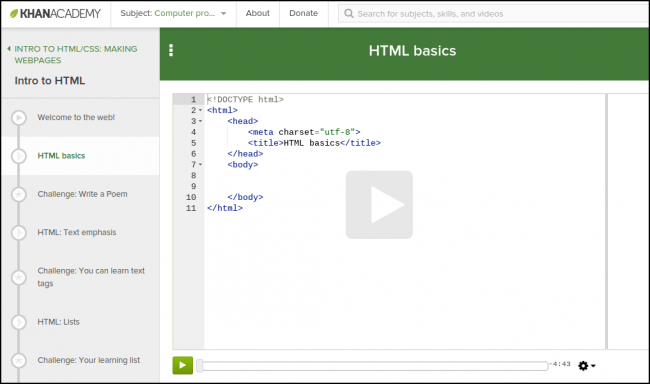 The company maintains its ability to give free courses through the support of a community of teachers and professionals who have dedicated their spare time to helping others learn how to become proficient in the craft of creating code. As more horror stories continue to pour out of established universities around America about rising costs of tuition, the interest on student loans skyrocketing, and textbooks that cost as much as a used Honda Civic from 1992, these days it’s more sensible to learn how to program for free than to pay anyone more than you absolutely have to. There’s no shame in letting the quality of your work do the talking instead of a plain old degree, and with so many top-notch resources to choose from, now’s the time to brush off that old keyboard and get cracking on some fresh code.